Double Action 1.3: I Said I’d Be Back! What’s this? A mini-map-emission for our most dedicated Boogalooers? Damn Straight. Bring it in tight for the latest map from Doum – a prison-themed shoot-em-up in the vein of your favourite badass brawlers. 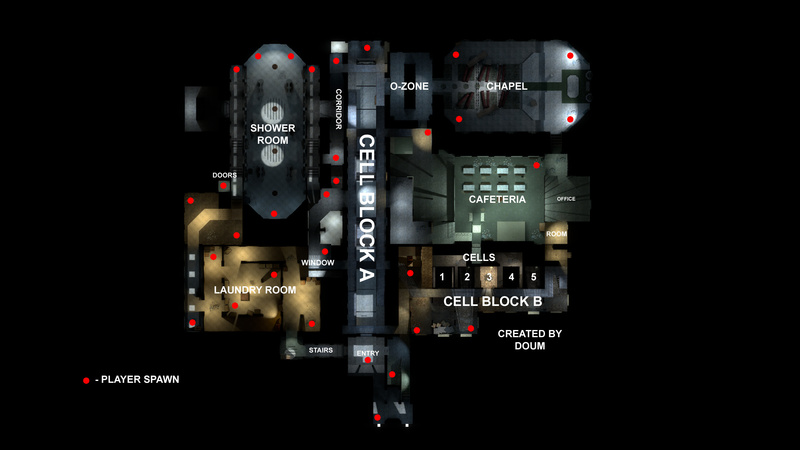 With tight hallways to concentrate the boom boom and high ceilings to exacerbate the zoom zoom, this map is a welcome addition to the Double Action library. Test your mettle in the showers but don’t drop the soap! You’ll have some slow-mo floatin gun totin drop soapin action heroes vying for your weak spots. Keep your head on a swivel and don’t spare the dribble because it’s time for a good old fashioned rumble on the catwalk. DEAD MAN DIVIN! Also included are translations submitted by our community’s very own IZUMI WING – You would have seen that name taking top position on the scoreboards and now you can see it in CHINESE! Much thanks to our dedicated players for keeping the dream alive. We know it’s been quiet on the western front but your dedication means the world to us. Keep it coming and don’t stop diving! This server-side patch fixes a rounding error in the vote tallying system, leading to votes failing unless there is no counter-vote. Windows and Linux Steam clients will also automatically update the local server component. This update is not necessary in order to effectively participate in votes. PS: Again with apologies to people hosting hands-off servers on a Mac, we’re only releasing this bug fix for Windows and Linux. Mac users can still join v1.2.2.2 servers with v1.2.2. Over the course of this weekend we’re expecting an increased number of cheaters using Double Action. During this phase, and in general, please be extremely careful when encountering cheaters. Some recently surfaced cheats are known to be able to expose your external IP address to the cheater. Using that IP address, the cheater could, criminal energy provided, exploit vulnerabilities in your router, operating system and other services in order to damage or take over your computer and other devices on your network. There’s a certain risk associated with anything on the internet. The ability to expose a user’s IP address comes from a fault in Source Engine, Valve’s game engine, and not from the Double Action codebase. Cheaters ruin the experience for everyone else and I wish we could remove them entirely, but as a free game we lack the resources to do so. Double Action is a game about being stylish in a fun way, and cheaters are the least stylish thing of all. I’m sorry we weren’t able to avoid cheaters.